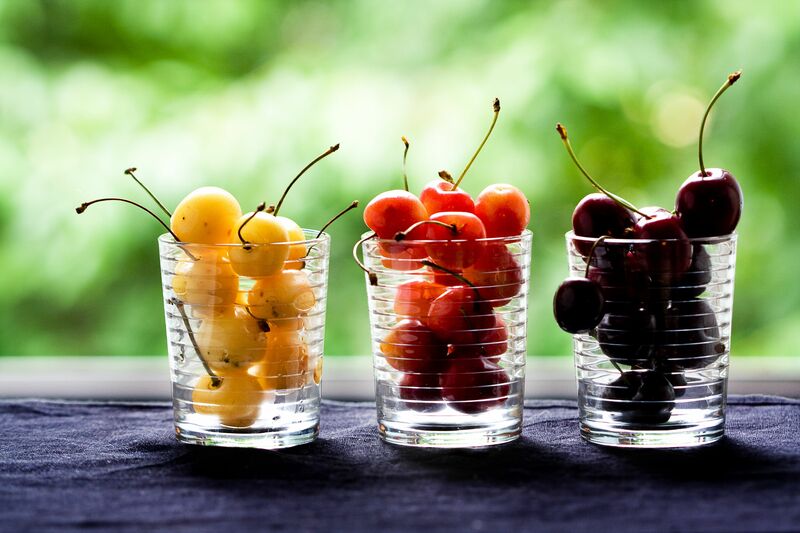 The big divide in the cherry world is between sweet and sour—and that divide is also a geographic one, with sour cherries reigning supreme on the East Coast and Midwest while sweet cherries rule the roost on the West Coast. That said, cherries come in more than just sweet and sour. Each of those big categories has several varieties within it. Learn about the big wide world of cherries below and pick up some tips for making the best use of them this cherry season. Sour or "pie" cherries, including Montmorency (like those pictured here) and Morello varieties, are tart in flavor and bright red in color, hence the practice of calling them "red cherries." They are celebrated in the Great Lakes region of the Midwest—Michigan especially—where they are only available for a few short weeks. Sour cherries are common on the East Coast as well​ but they are scarce in the West. No matter where you find sour cherries, look for bright red unblemished cherries with stems still attached. Sour cherries are best when baked. Pile them in a pie crust, top it with sugar, and bake it until it's tender and juicy, which will take about an hour. You can also consider baking up a Sour Cherry Cobbler. Slightly heart-shaped dark red sweet cherries are primarily grown on the West Coast. The "black" designation refers to the mahogany color of their flesh, only a few varieties have particularly dark skin. There are many varieties, the most well known of which is Bing, pictured above. Lambert, Chelan, Sweetheart, and Tulare are other names to look out for. They are wonderfully sweet—almost like candy when eaten out of hand—and super juicy, too. Try them in a fresh tart: pre-bake a tart shell, line the bottom with ricotta cheese or a pastry cream and then arrange fresh pitted cherries on top. Use Bing cherries to make Brandied Cherries with great success. Add pitted cherries to salads—they work wonderfully in place of cherry tomatoes. Pop whole cherries in the freezer and enjoy them as a sweet cooling snack. Look for shiny, taut-skinned black cherries at the market. Note: Because there are so many varieties, the sweet cherry season starts in May and runs well into August. Learn more about sweet cherries with this quick Guide to Sweet Cherry Varieties. Pink and yellow Rainier and Royal Ann cherries are lighter and less cloying than black cherries. They are mostly grown in the Pacific Northwest. Because of their light color, Rainier cherries (pictured here) show their bruises, which is most useful when you're the customer. Choose unblemished, shiny cherries. These sweet cherries are perfect for snacking or eating as a simple dessert all on their own. Or use their pretty colors to full advantage by adding them to cheese plates, crudité platters, and salad. Look for pink and yellow cherries with plenty of blush, it's caused by sun exposure which usually heightens sweetness.